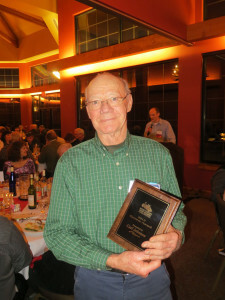 On January 20th at the Wilderness Resort, the Wisconsin Grape Growers Association (WGGA) announced the 2012 Award Winners for the Wisconsin grape and wine industry. The announcements were made during the Wisconsin Food & Wine Pairing Dinner which was the kick off event for the 2013 Wisconsin Fresh Fruit and Vegetable Conference. 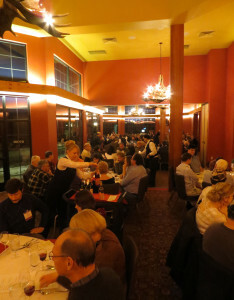 The dinner was at full capacity with 130 attendees who enjoyed a five course meal which paired nine Wisconsin wines, including Danzinger Vineyards Mississippi Mist with bacon wrapped sea scallops and Sandstone Ridge Frontenac Gris with a sausage and feta florentine phyllo tartlet. Conference attendance surpassed 800 registrants for the first time in this year. Approximately 200 of the attendees were wine makers and grape growers, according to Anna Maenner, executive director of the Wisconsin Grape Growers Association. Dean Volenberg, University of Wisconsin, Industry Award– Ryan Prellwitz, president of the WGGA, said the Industry Award is given to someone who, “is focused on the full circle of getting Wisconsin wine to market.” It’s hard to argue that Dean Volenberg has not been a big part of the growth of the Wisconsin wine industry. When Dean joined the University of Wisconsin in 2006 as an agriculture agent in Sturgeon Bay, there were 47 wineries in the state. During 2012, there were at least 88 wineries in Wisconsin. Volenberg’s “Vineyard IPM Scouting Reports,” produced weekly during the entire growing season, have become a critical resource for Wisconsin grape growers. Covering everything from pest control to tips on avoiding lightning damage, Volenberg’s weekly report contains practical and timely information for grape growers across the region. 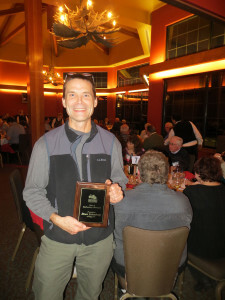 Carl Johnson, Parallel 44 Winery, Grape Growers Award– Johnson first planted grapes at Parallel 44 in 2005, two years before the winery released its first wine. Father of winery co-owner Steve Johnson and a Master Gardner, Carl has succeeded at growing certain grapes in Door County that are at the northern end of their ranges. Johnson has so far planted over 7,000 vines with the goal of establishing a 25 acre estate vineyard which would be one of Wisconsin’s largest. Starting with Marechal Foch and Frontenac, Johnson then added less cold hardy cultivars like Vignoles and Seyval Blanc which relatively uncommon in Wisconsin. He also planted some of the first Petite Pearl vines at a U.S. commercial winery. 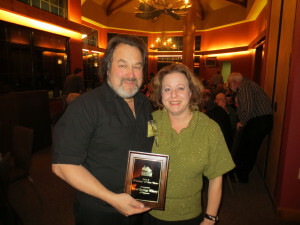 Steve DeBaker, Trout Springs Winery, Winery Award– The third AVA in Wisconsin -The Wisconsin Ledge AVA- is the brainchild and passion of Steve De Baker of Trout Springs Winery in Greenleaf. DeBaker spent seven years and over 4,000 hours to obtain approval for the AVA which was made official during July of 2o12. During the awards ceremony, Julie’s husband, Philippe, told the audience that renowned grape breeder Elmer Swenson came to winery often in the early days to meet with Wollersheim’s founder, Bob Wollerhsheim. 2013 is the 100th anniversary of Swenson’s birth. Special Mention– The passing of Tom Martell was also noted by WGGA president Ryan Prellwitz. Martell was on the Board of the Minnesota Grape Growers Association for 10 years and is remembered for his tireless commitment to cold climate grapes. Thanks for your support Michael! Hope to see you at the Wisconsin Fruit and Vegetable Show next year.